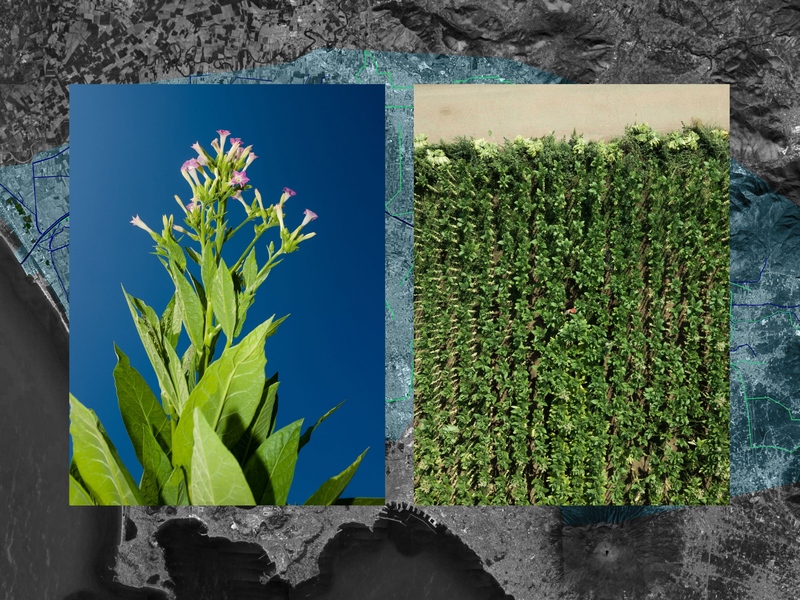 LEFT: White Burley tobacco plant in bloom. 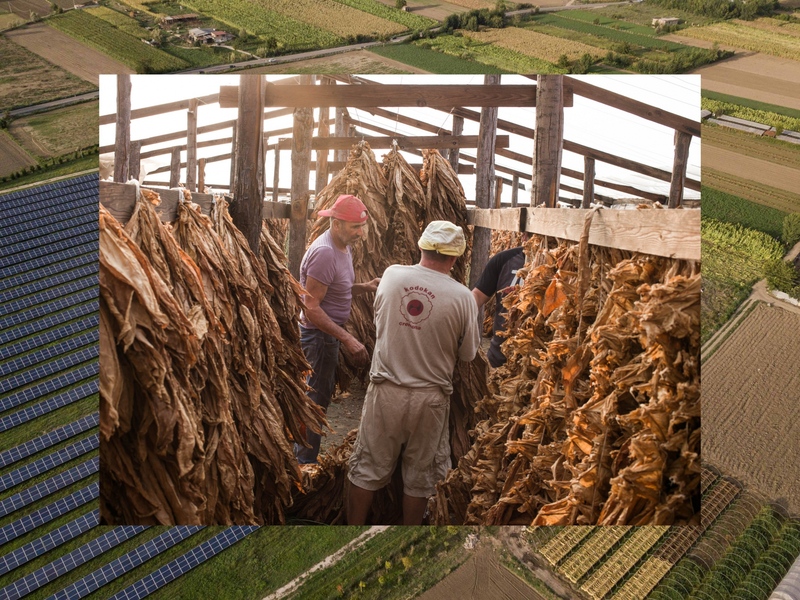 RIGHT: Tobacco harvest seen from above in Marcianise, CE. BACK: Cartographic representation of Caserta and its rural areas. In blue the Regi Lagni Canal system and its surrounding areas ( both urban and agricultural ), heavily poisoned and intoxicated in the last decades with different kind of environmental disasters. They serves the aquifer of more then 3 million people. The entire network has been mapped with its ramifications by thousands high resolution satellite images. 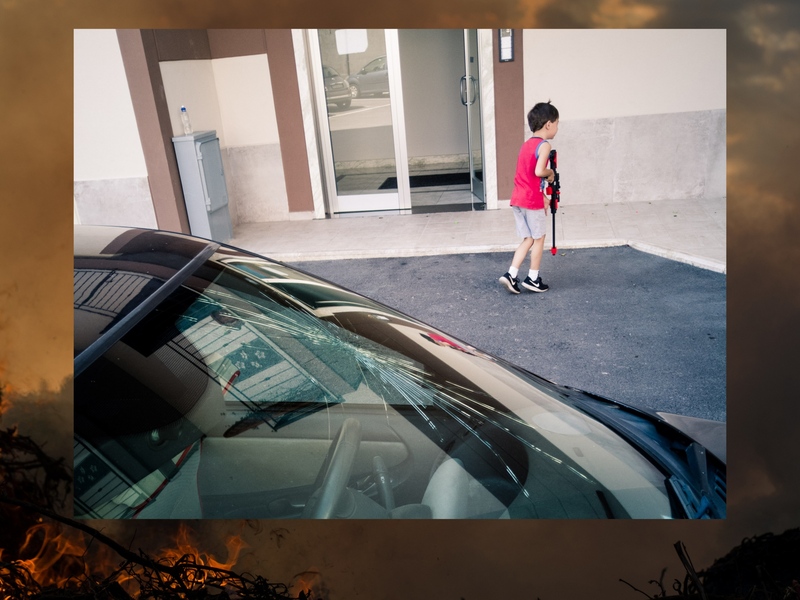 This images will be used for an Augmented Reality in-depth, with an interactive video-flight and details on the history of critic areas -years 2002-2018- where the impact of the Camorra, through fires, spills and landfills of toxic waste is visible from the sky. I'm also cooperating with the public society Enea that controls thought physical/chemical analysis the entire area since 2003. 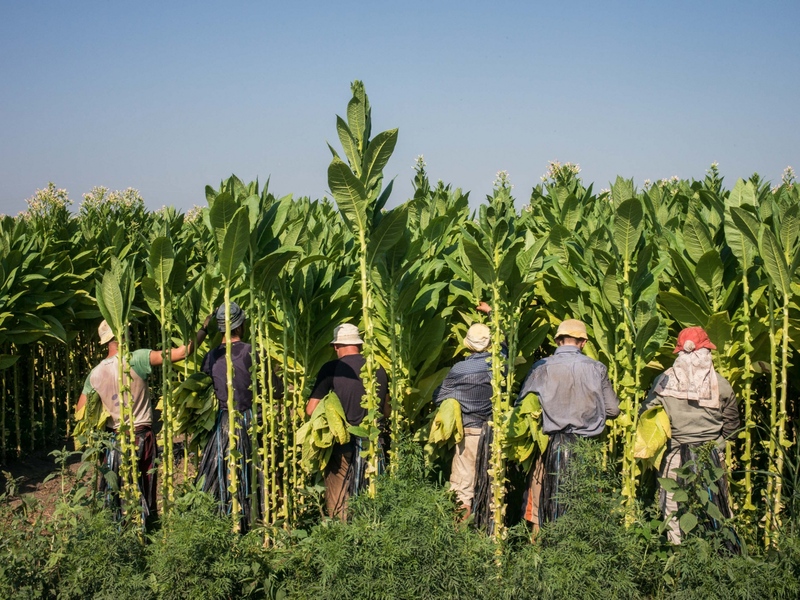 Tobacco harvest between the municipality of S. Maria C.V. and S. Tammaro, CE. Tobacco leaves are cropped as they ripen, from the bottom to the top of the stalk. "Cropping", "Pulling" and "Priming" are terms for removing mature leaves from tobacco plants. This fields belongs to Gennaro Iodice, board member of the local Tobacco trade associations, and harvest by seasonal workers from Albania. Every summer since the early 90’s they works with Iodice, this is the second generation of the family working in Caserta. After a few weeks this picture was taken (08/18) the Stir waste treatment plant that borders with this fields was burned down, a new environmental disaster. For this reason it's still unclear if Iodice will be able to sell its tobacco this year. This facility is the fourth burnt in the district since July by Camorra clans, hegemonic power of the national waste production system. 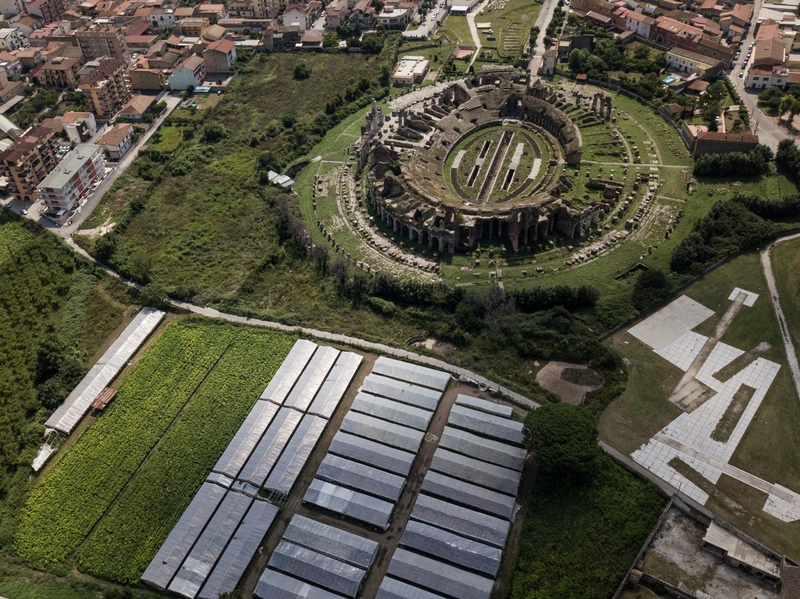 A tobacco cultivation borders with the Roman Amphitheater of S. Maria C.V., CE. Location of the first and most famous gladiator school, this amphitheater is second only to the Colosseum in size and probably the model for it. It may have been the first amphitheater to be built by the Romans at all and also used for navy battle games. In 2014 it was visited only by about 50.000 tourists, mainly locals. Tobacco harvest between the municipality of S. Maria C.V. and S. Tammaro, CE. This fields are close to the Stir waste treatment plant burnt on November 1st in S.Maria C.V. (CE). This facility is the fourth burnt in the district since July by Camorra clans. They took over the public management of waste in Caserta from the 90s, creating a waste crisis after another. In the last 5-10 years different kind of Mafias from all over Italy started to cooperate in this huge business, often cooperating and helping each other. National and local laws in this field were modified with the complicity of different governments to let Clans able to control a vast variety of contracts. Only in the last 5 years an average of almost 150 arsons have been set across the country in waste treatment plants and waste deposits. 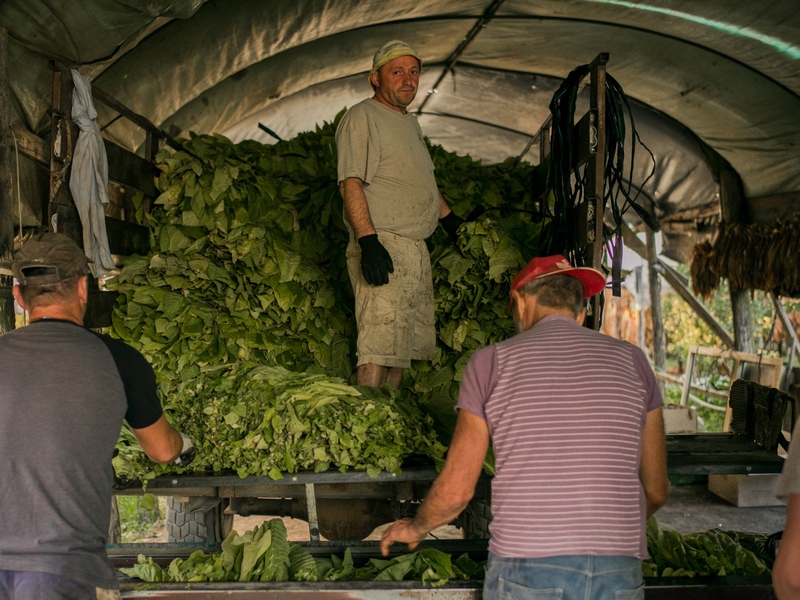 LEFT: Seasonal workers carrying water and bundles for tobacco leafs bandages. RIGHT: Seasonal worker resting under the shadow of tobacco plants. BACK: Tobacco harvest with the Stir waste treatment plant (the upper-left side) on the background, some months before its arson. 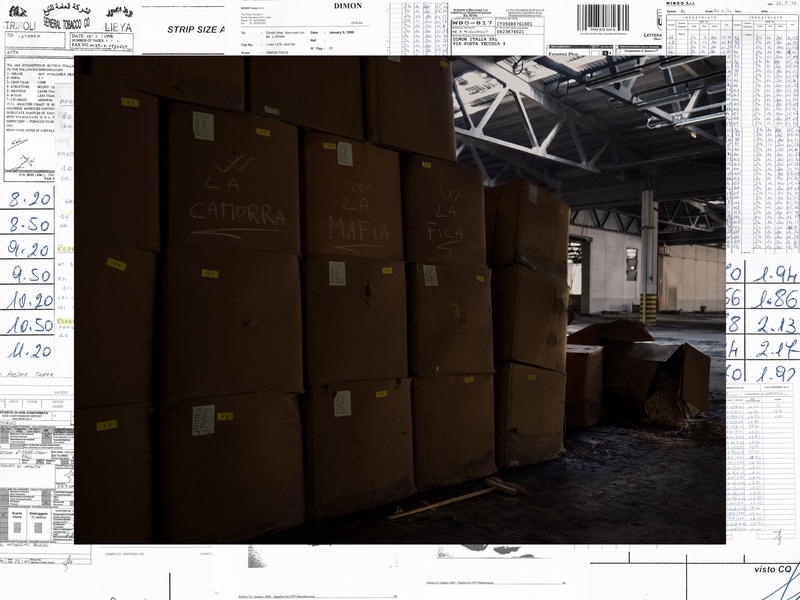 AR IN-DEPTH: archive documentation of the former tobacco factory of Sparanise, CE, found in the facility. 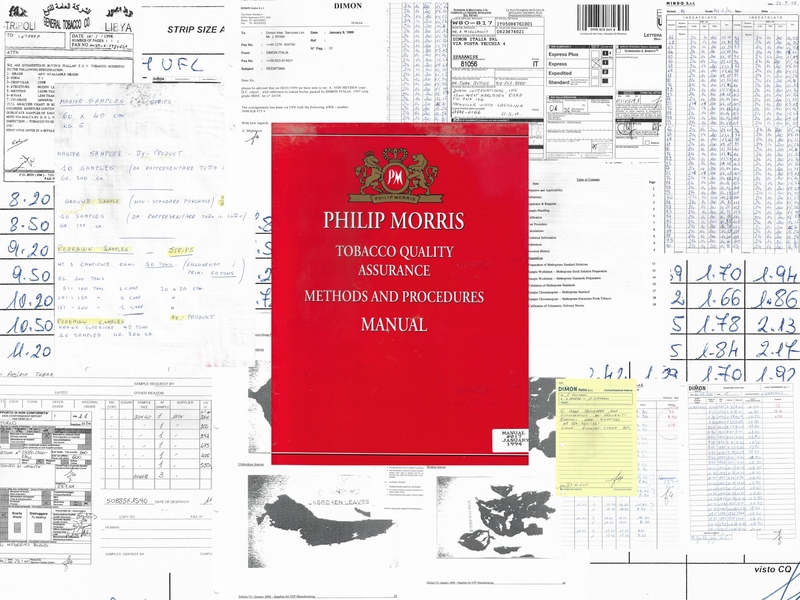 This documents, mainly dating to the 90's, shown the business activity of the former tobacco factory with Philip Morris in Italy, several European countries and in the States (North Carolina). Beyond that also quality system documents and physical chemical analysis. Sparanise is nowadays one of the most active city of the district in terms of public awareness of waste cycle issues. They're fighting with local government against the construction of new waste treatment facilities outside the city area because of clear Mafia infiltration with this new projects. Raw cured tobacco left to rot in the abandoned tobacco factory of Sparanise, CE. This former production site of 60.000 square meters has been active for more then 30 years, then abandoned in the early 00’s after a series of bankrupts. Since then, has been matter of a parliamentary question but has never been decontaminated. Inside it there are many types of special wastes and asbestos, partially burnt by an arson in 2017. Toxic liquids burning trees were also found in 2014 by ARPAC (Regional Agency for Environmental Protection). The area borders with several houses. 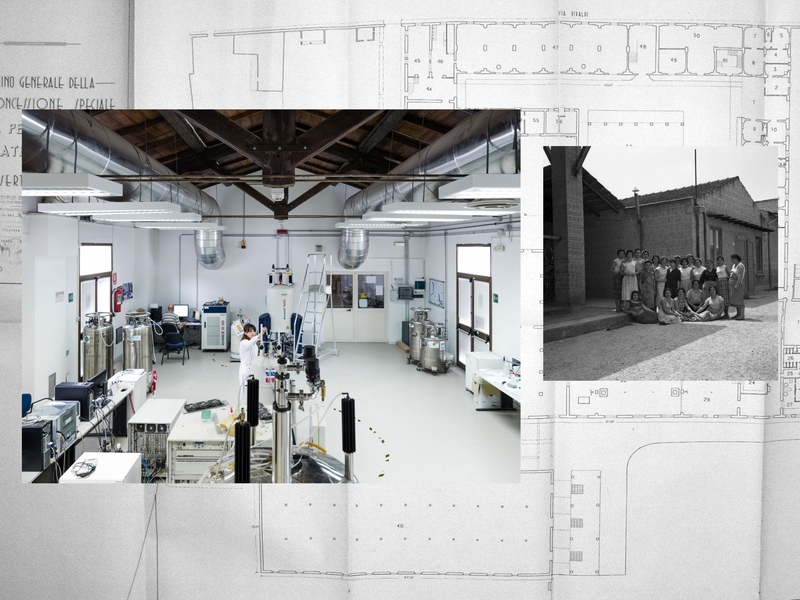 The many lives of former Catemario tobacco factory, now home of a local Science and Environmental Technologies Department, Unicampania university, Caserta. LEFT: Nuclear Magnetic Resonance laboratory of the Science and Environmental Technologies Department. The buildings now home of environmental and food quality researches was a former tobacco factory. Owned by the Catemario family, the facility was productive from the 20's till the late 70's. RIGHT: (Camerario private archive, approx. 1935.) Female tobacco workers, also known as “Tabacchine”, inside the Catemario tobacco factory. “That of the Tabacchine is a story denied by the male-oriented meaning of the agricultural productivity which still nowadays dominates the setting of historical-economic researches. It’s clear that the percentage of women involved in this process, at national level and even more local, was very high and greater than male employment. However, when it comes to tobacco processing, we only remember the farmers or dealers, the quantities of production, the institutional representatives or the politicians who, one way or another, have managed the most important economic activities of the region, without ever mentioning the massive yet invisible presence of women, whose role of primary importance has been underestimated.” from “Luoghi, archivi e memoria del lavoro delle donne” by Rossella Del Prete, Economic History associate at Unisannio university, Benevento. BACK: (Camerario private archive, approx. 1924) Map of the former tobacco factory. 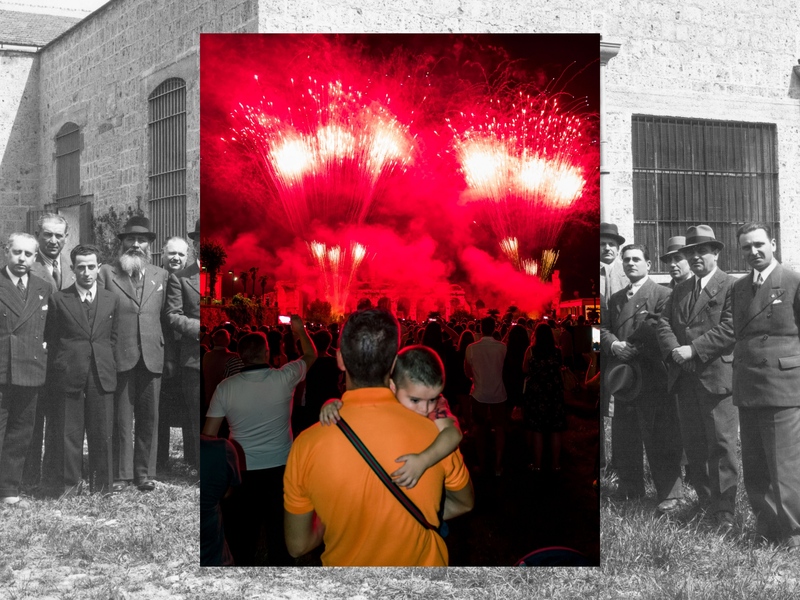 FRONT: Families attending the Feast of the Assumption, typical agricultural commemoration, with fireworks across and inside the roman Amphitheater of S.Maria C.V., CE. BACK: (Catemario private archive, approx. 1935) The Catemario family and partners in front of the former tobacco factory of Caserta. Arson of unsorted wastes and plastics in an agricultural field near S. Angelo in Formis, CE. Aerial view of the Ilside waste treatment plant, Bellona, CE. The area has been burned down several times, with biggest blazes in 2012 and 2017. Despite the critical environmental and health situation for citizens, this former waste treatment plant has never been decontaminated or making safe for new blazes. The Ilside is located nearby the Volturno river and stands side by side to tobacco and olive plantations. FRONT: One of the structural cracks of the New Bridge of Capua, CE. In September 2018 it was seized and closed indefinitely. It use to serve the intense urban and industrial traffic connecting different areas of the district of Caserta, now only practicable by the the nearby ancient Roman Bridge. 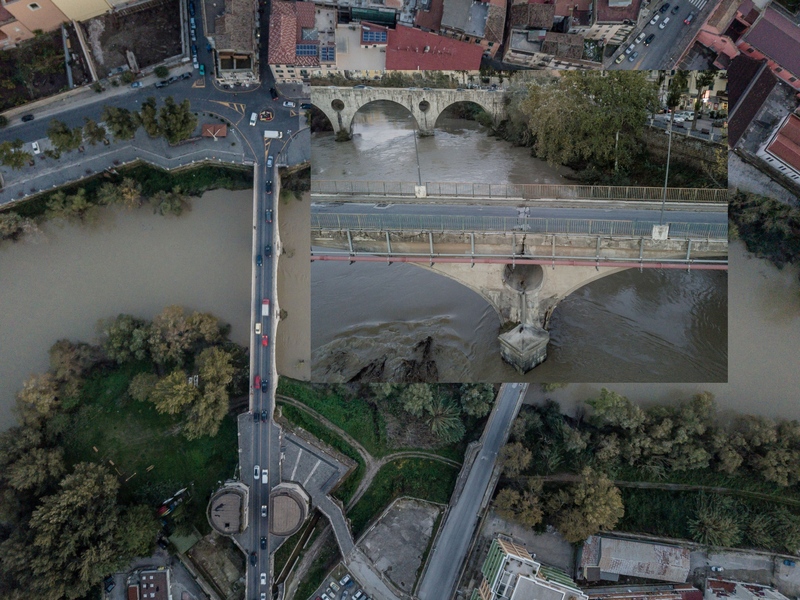 BACK: Aerial view of the Volturno river crossed by the two bridges of Capua. On Nov. 22, the Court of Santa Maria C.V, CE, charged for perpetrated environmental disaster two former majors of the city, Carmine Antropoli and Eduardo Centore, for the systemic toxic contamination of the Volturno river. Also charged by Carabinieri were some local public sector managers and the legal of the private company responsible for the maintenance of the bridge. Multiple evidence have been found for spillage of toxic liquids and uncontrolled waste. Carabinieri also have seized a considerable amount of documents focusing on the construction and assignment of works for fake-but-payed maintenance. The environmental quality of the water in the drainage basin of these canals shows another critical issue that relates to cancer deaths. They serves more then 3 million people in 112 municipalities between the province of Caserta and part of that of Naples. 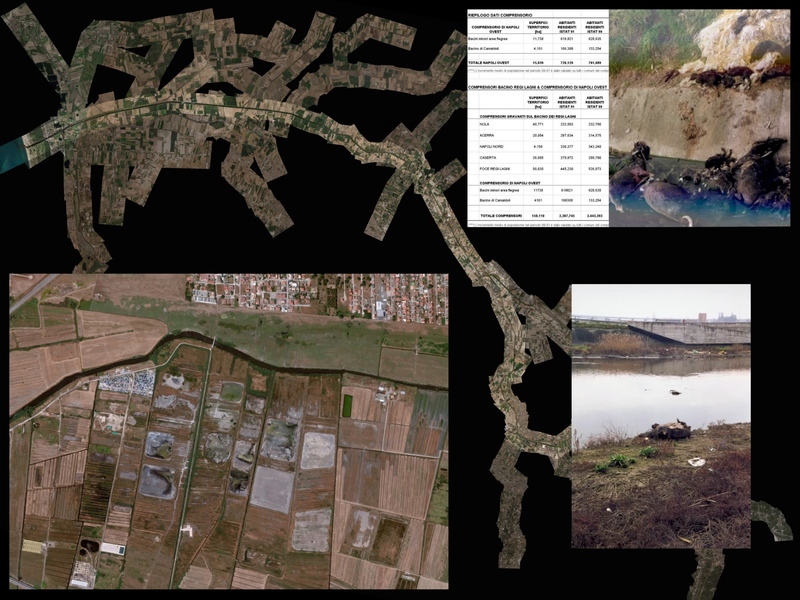 Satellite image of ponds poisoned by the Casalesi clan with hundred thousands canisters of toxic liquids and industrial wastes buried in this area near Villaggio Coppola, Castel Volturno, CE; (archive: Enea) chemical analysis chart of the northern canals; (archive: Enea) intoxicated death buffaloes left to rot near or inside the canals. Buffaloes are typical of this area and with their milk the original Mozzarella cheese is produced. Thousands merged satellite images of the Regi Lagni canal system and its ramifications. The final image is almost 230k Megapixel. 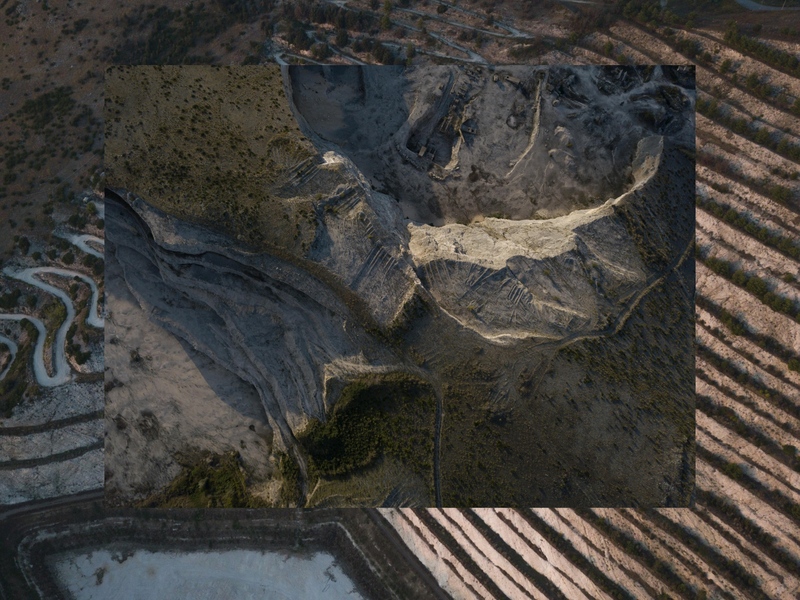 This images will be used for an Augmented Reality in-depth, with an interactive video-flight and details on the history of critic areas -years 2002 to 2018- where the impact of the Camorra, through fires, spills and landfills of toxic waste is visible even from the sky. I'm also cooperating with the public society Enea that controls thought physical/chemical analysis the entire area since 2003. I'll digitalize their picture archive and got access to all datas not involved in sealed court cases. 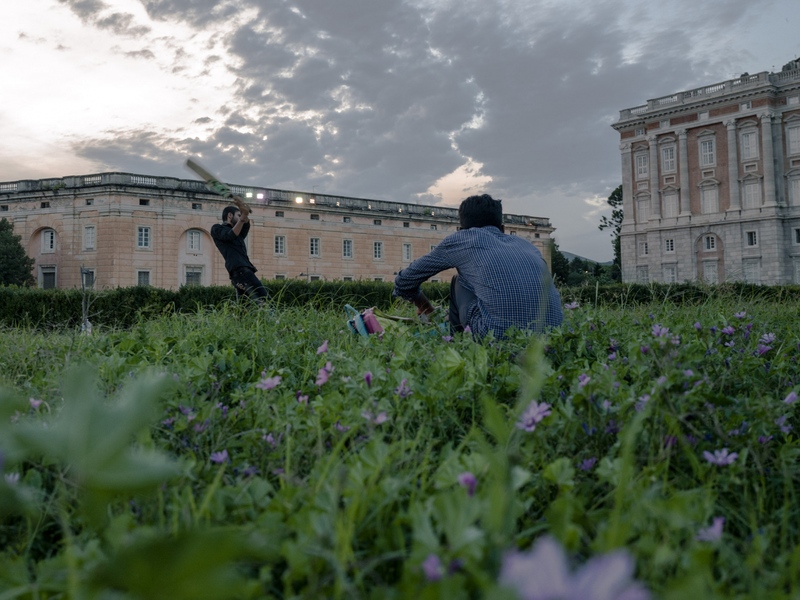 Indian and Bangladeshi migrants playing cricket in front of the Royal Palace of Caserta. Portrait of a seasonal worker for the harvest at Iodice’s farm in S.Maria C.V., S.Tammaro and Marcianise, CE. 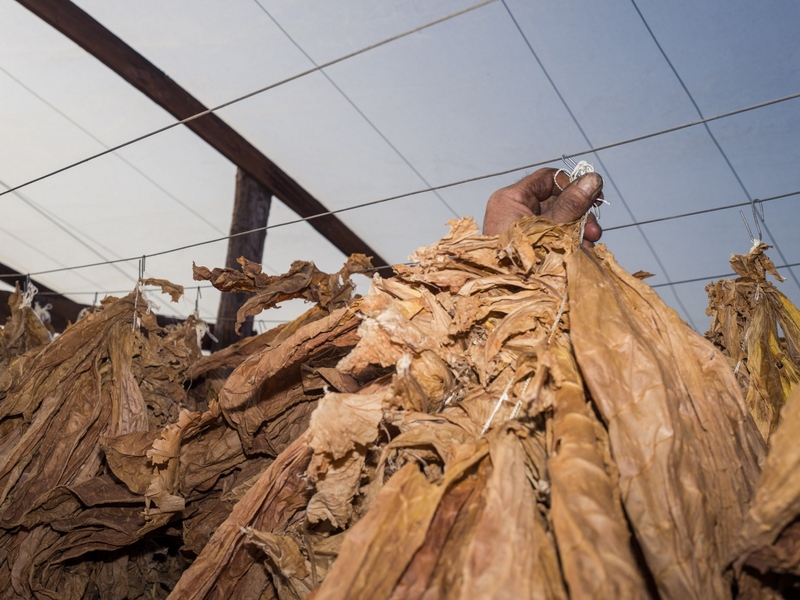 Tobacco leaves are stitched together with big white threads on specific mobile machines produced in Santa Maria a Vico, CE. Tobacco dried in the air under a greenhouse, also useful to block the leaves fermentation, in San Tammaro, CE. Aerial view of the former Statuto quarry, San Prisco and Casagiove surrounded by tobacco fields. Located at the base of the Tifata mountain, this is one of the many quarries that characterize the landscape of the district, open wounds clearly visible from the sky. Almost all the mountains and hills of the area have been firstly exploited in the 60s-80s without any concerning for the environment and then, once abandoned and without an organic urban development plan, they became spots for illegal toxic buried landfills for Camorra and Casalesi mafias, with strong pollution of the aquifers that serves agricolture fields and urban water services. Almost any of this quarry have never been decontaminated. The testimonies of the former custodian of the quarry, now deceased, have shown to investigators that also in this mountain the spillage of waste by the hands of the Casalesi Clan was massive. FRONT: Aerial view of the Tutuli mountain completely eroded by two quarries between the border of Vitulazio and Camigliano, CE. 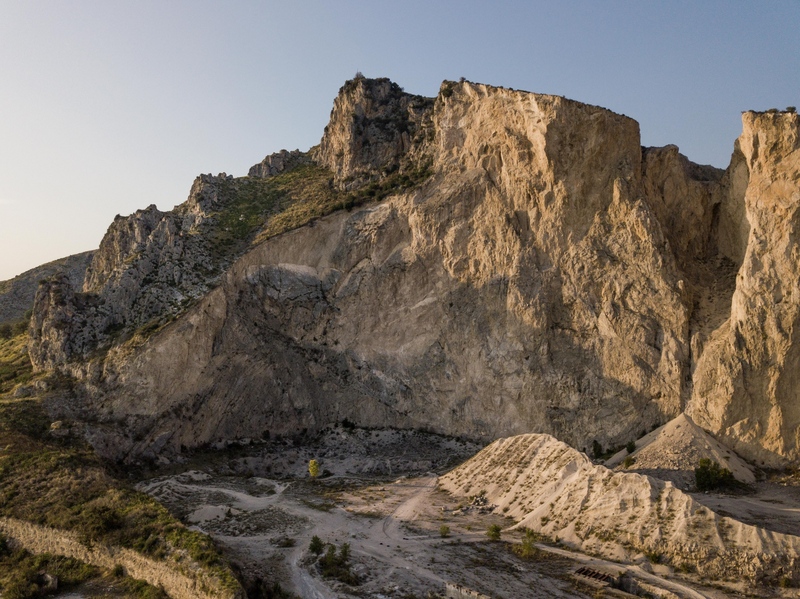 The quarry in Camigliano was seized in 2014 but still illegally active. The one in Vitulazio, propriety of the Statuto family, was definitely seized in 2011 by the anti-mafia pool of Naples and since then abandoned. 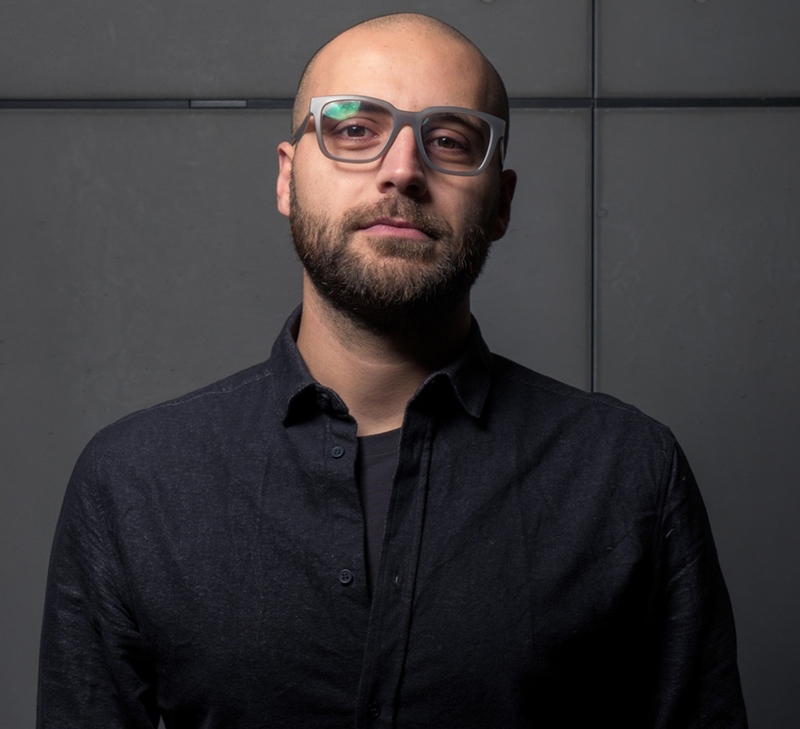 "To conduct the illegal trafficking it was in fact Statuto, a subject affiliated to the Camorra, with strictly entrepreneurial duties taking an interest in various sectors of finance. His key role is confirmed by the fact that at his company have been identified large quantities of illegal waste managed illicitly. Conducting this activity in well-identified companies (such as the Vitulazio quarry), in inhabited places not far from the center, further demonstrates the possibility for criminal clans to act in a completely undisturbed manner.” extract from the “Regional Waste Cycle and Related Illegal Activities report” by the Parliamentary Investigation Commission, approved by the Italian Chamber of Deputies in 2000. 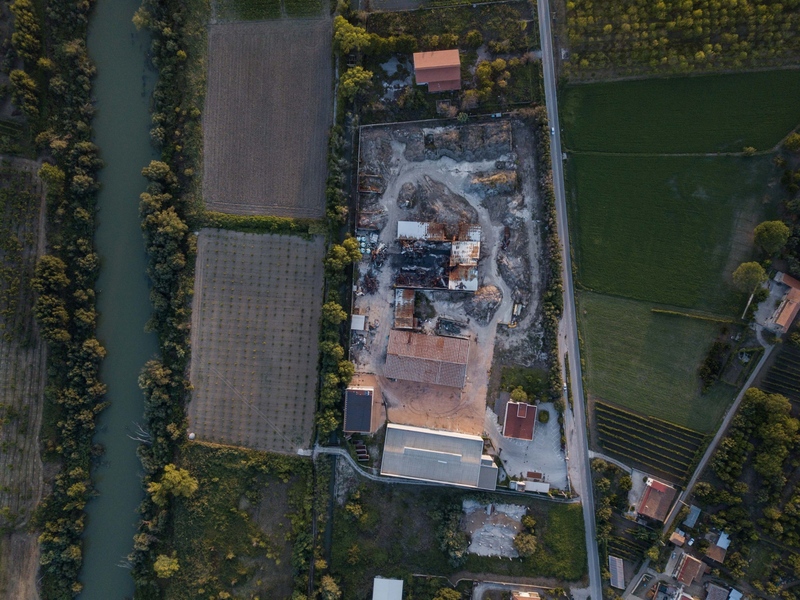 BACK: Aerial view of the concrete Vittoria quarry, propriety of Cementir, Maddaloni, CE. The quarry, still active and productive, is most probably the biggest maker of PM10 (fine particulate matter) in the province. Local homeowners association, doctors and environmental groups are fighting with the regional government since years asking for the complete shut down and decontamination of the area, with long-lasting relationships evidence of lung cancer rates and fine particulate matter. The Vittoria quarry, propriety of the German Heidelbergcement holding since the end of 2017, has been part of the Roman Caltagirone family proprieties for decades. FRONT: Gennaro Iodice working in his farm under a tobacco greenhouse. Is typical that dark tobacco sap, which dries into a dark gum, cover farmer’s bodies and hands. For this reason Gennaro is also known by friends as “pell’ e ors” -bearskin-. BACK: Solar plant near tobacco fields in Marcianise, CE. After a new series of arsons in big-size waste treatment facilities that have characterized the Summer and the Autumn of local communities, the 5 Star Movement & Northern League coalition national government is giving unclear and often harmful answers, in a mix of never-ending electoral campaign and vague proposals. The 5 Star Movement has taken roots in South of Italy, where the vast majority of the population elected this populist party. They organized a special Council of Ministers in Caserta on Nov. the 19th and co-signed with the Regional President of Campania Vincenzo De Luca a Memorandum of Understanding for urgent action for the "Land of Fires" that pushed forward for concrete improvements only for few of the many critical issues in the area. On the other side Northern League leader, Matteo Salvini, Italian Minister of Interior & Vice President, further polarized public opinion on waste treatment issues and the making of new incinerators, with a series of public speeches, TV talks and tweets that created a fertile base for criminal organization to take over a new cycle of public investments with technologies and methodologies that have been not only a failure, but also extremely fatal for the urban and agricultural lands of Campania in the last 20 years. Mr Salvini is also a shareholder of A2A,(company that builds waste facilities throughout the national territory and shareholder of past and future structures in Campania), for a very clear conflict of interests. Companies that belongs to Camorra and corrupted entrepreneurs (de-facto bio-terrorists) were pleased by this assist that will be really useful for criminal activities at the beginning of 2019 when the waste incinerators of Acerra (NA) will be will temporary shut down for extraordinary maintenance. This will be the moment when these criminal entities will try, as already successful done in the past several times, to lobby politics for the declaration of a new emergency state, getting over normal bureaucracy for the construction and management (blocked at the moment for clear irregularity and criminal structure) of new waste facilities. For these reasons, given the well-established criminal complicity of the regional government, different kind of citizens from Caserta and Naples, activists, doctors, engineers, biologists but also Priests and a small part of the strong Catholic community in the area, are joining together in a new form of activism, working for the defense of a territory that unfortunately has historically been set as the toxic landfill of Italy. Citizens of Pignataro Maggiore and activists from the movement #STOPBIOCIDIO -stop biocide- demonstrating outside the F.lli Gentile Srl facility, one of the three companies that wants to build new waste incinerator plants in the north Volturno area of the ASI consortium, nowadays considered the largest underground dump in Europe. "... the Alekos SpA, based in Milan, presented in June ’18 a request for the construction of a production site for agricultural soil conditioners of waste in the ASI area of Sparanise and Calvi Risorta; on Oct. 9 '18, I requested information on two other projects, always in the same area, for the making of new waste treatment plants. The F.lli Gentile SRL, Euthalia SRL, Garden SRL and Alekos SPA would all like to build new facilities in the north Volturno area of the ASI consortium. In particular, Alekos SpA and Garden srl have applied for the respective plants precisely in the area known as the former Pozzi-Ginori (former baggage factory), which on June 7 2017 was subjected for environmental disaster due to the discovery of an underground dump of toxic waste that has been estimated to be the largest in Europe. Moreover the two future plants are expected to raise approximately one kilometer away each other and the urban development plan of the ASI consortium has expired since the 80s. 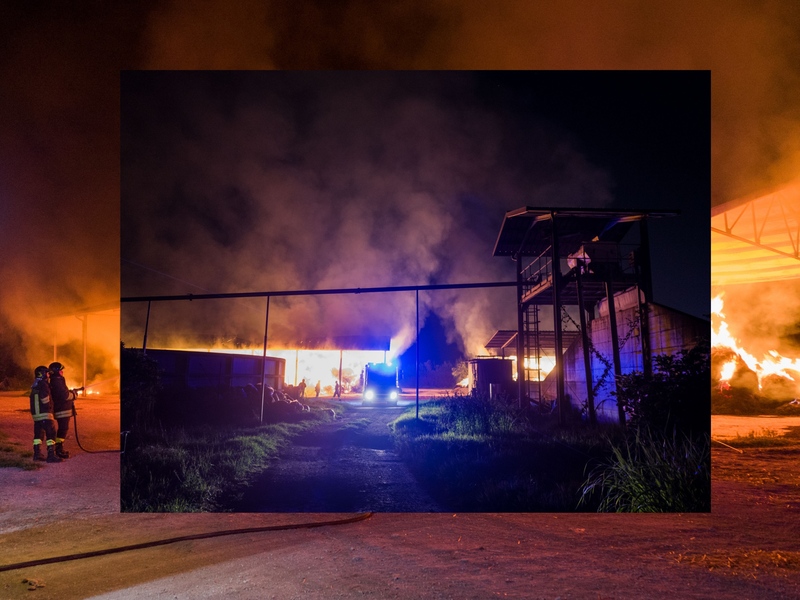 On 24 Sept. ’18 the waste dumping facility of Gesia SpA in the ASI area of Pastorano was burnt and from further research, the company Alekos SpA appear to hold 100% of the company Di Nardi Tire SuRL owned by Alberto Di Nardi, ... and that Mr. Luigi Gennaro De Crescenzo is board chairman both of Alekos SpA and DHI SpA, owned by the Di Nardi family. Alberto Di Nardi was arrested on 7 Mar. 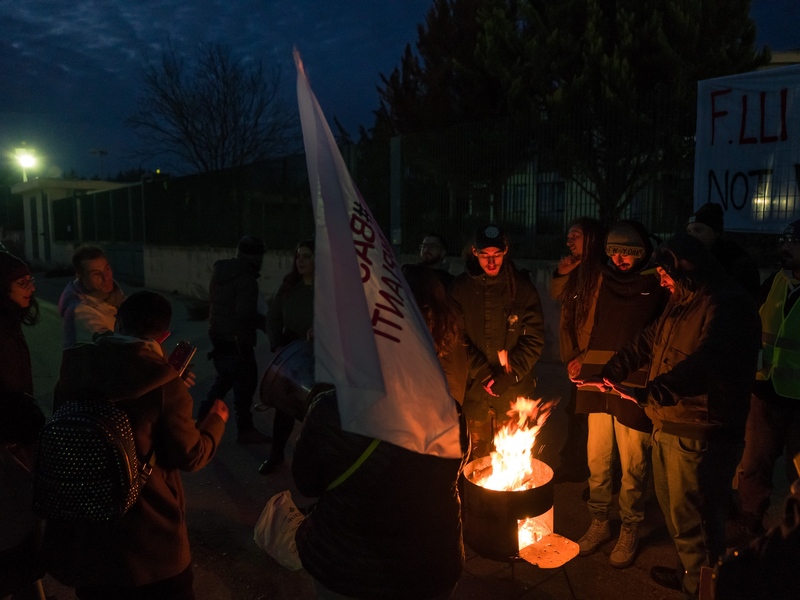 '16 with charges for piloting of waste management contracts in Maddaloni, corrupting the former mayor of the city, Rosa De Lucia, who had also been arrested through the use of bribes and consequently both were convicted. On 24 Oct. ’18 the DHI Di Nardi holding industriale Spa, also set in Pastorano, suffered a third seizure for tax evasion, estimated in 4 million EUR. I also would like to add that the president of the ANAC Raffaele Cantone asked the prefect of Caserta on 2 Aug. ’17 an anti-corruption measure against this company but that soon later on 17 Jul. ’18 the same DHI was registered in the "white lists" of the Prefecture of Caserta, allowing them to transportation of landfill materials, trans-national transportation and disposal of waste, and other related activities. Seen that the projects presented by Euthalia, Garden and Alekos all results in many parts equal, even with the same images. Moreover the quantities of waste that these plants would treat will go far beyond the needs of the entire province of Caserta. I also remember that citizens, committees and territorial associations have been demonstrating for years and with greater force in recent months, asking for the decontamination of this areas, never made by the regional government.“ from the parliamentary question made by the 5 Star Movement senator Vilma Moronese, 15 Nov. ’18. FRONT: Citizens of Pignataro Maggiore and activists from the movement #STOPBIOCIDIO (stop biocide) exhibit a banner nearby the company Euthalia, one of the three societies that are planning to build three new waste incinerator plants in the ASI area of Capua, nowadays considered the largest underground dump in Europe. "Here 2 million cubic meters of toxic waste have been buried" declared Sergio Costa, former general of the Italian Forestry corp and current Minister of the Environment, who has revealed with a work of years made together with journalist Salvatore Minieri the enormous environmental disasters that this area suffered. New aggregations of many local environmental movements and citizen associations are taking over the fight against new incinerators and speculations in a district literally destroyed and poisoned by a mix of Camorra and legal-but-criminal entrepreneurial interests often facilitated by Regional and National governments of the last 20 years. BACK: Documents made by the NOE corp of Carabinieri on environmental interceptions between Caserta and Rimini (photos and audios) about meetings between the current mayor of Caserta, Carlo Marino, and representatives of companies led by Casalesi clans, such as Green Lab SRL and Xeco SRL, between 22nd January and 6th August 2018. This meetings ensured rigged contracts for the management of public waste collection, waste composting plants and the installation of micro-filtered public water systems, with a turnover, only related to these contracts, of hundreds of millions of EUR. "We're asking and providing by our self independent informations, knowledge, integrated approach to environmental issues and creating a new non-partisan network of territorial struggles. These are the topics on the eternal dish of the Land of Fires." from the regional assembly #STOPBIOCIDIO, Saint Francis church of Marcianise, CE, Nov. the 29th, where this picture was taken. 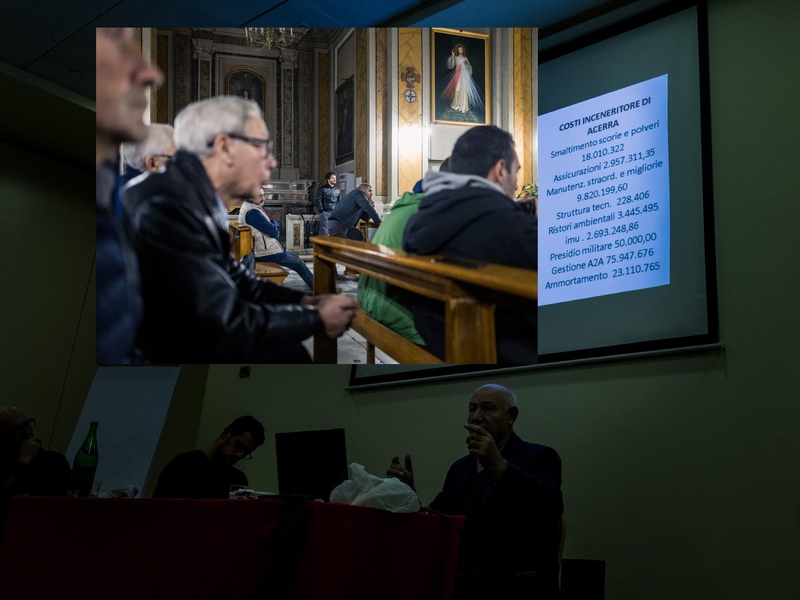 BACK: The biologist Stefano Tonziello, the environmental engineer Raniero Madonna and the activist Vincenzo Tosti leading the 2° technical conference “Land of Fires and Environmental Politics”, organized by the association “Rete Cittadinanza e Comunità” in Caserta on Nov. the 22th. They organize and provide self independent informations and technical knowledge on the waste cycle management to citizenships with weekly base, explaining with datas and scientific methods the corrupted and criminal management of waste in Campania (now also widespread all over Italy), looking and providing practical homemade solutions and providing proposals on public management of waste. 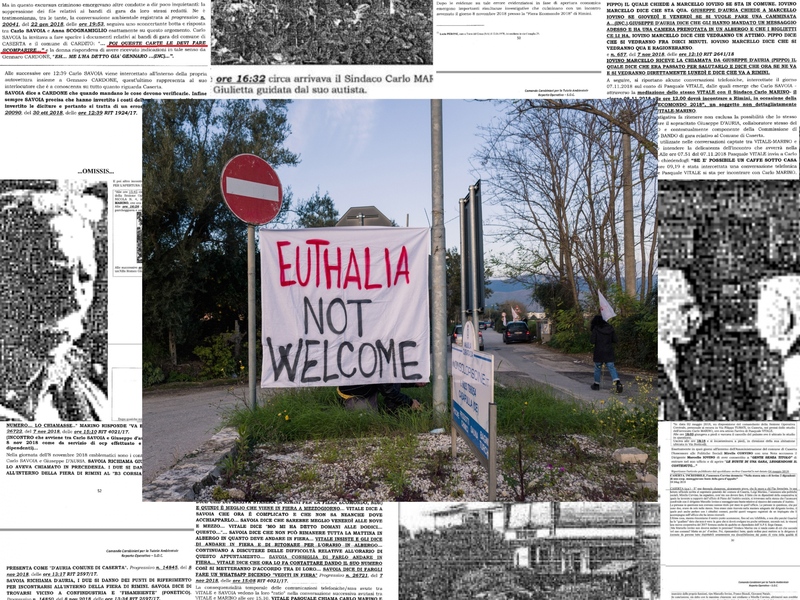 Their network is made of hundreds of activists and citizens, daily connected thought Facebook, that keep monitored vast areas of the province of Caserta and Naples from arsons and illegal activities connected to environmental disasters. The “Piccola casa di Nazareth” church between Casapesenna and Casal di Principe municipalities, CE. 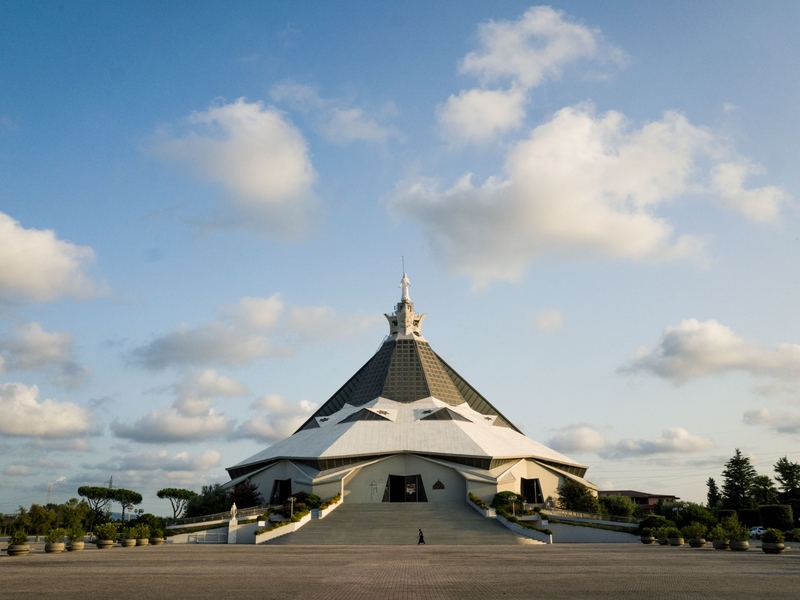 The structure, inaugurated in 1988 and visited by Pope John Paul II in 1990, has been involved in a police operation for exorcist rites and sexual violence on minors. Its priest, Don Michele Barone, was arrested in early 2018. FRONT & BACK: Night arson of a buffalo farm propriety of a well-know camorra family of Marcianise, the Bellopede. At the beginning of 2018 anti-mafia magistrates feared again the idea of setting up a "curfew" in Marcianise. The latest was established in 1998, after a series of murders for Camorra. That year the town of almost 40 thousand citizens recorded over 50 murders for Mafia. 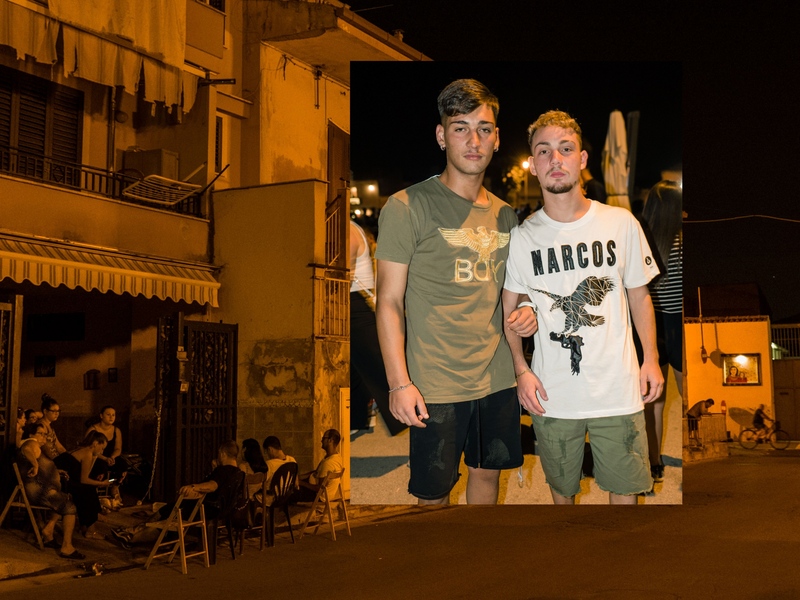 RIGHT: Giuseppe and Mario attending the Feast of the Assumption in S. Maria C.V.. T-shirts depicting nazi symbols and assault weapons are fashionable among youths and often produced between Campania and Puglia with the complicity of mafia and Chinese crime organizations. BACK: A family with friends in Portico di Caserta, trying to escape the summer heat outside their house. FRONT: Kid playing in its neighbrohood in S. Maria C.V., CE. BACK: Fire of brushwood in a tobacco field, Marcianise, CE. 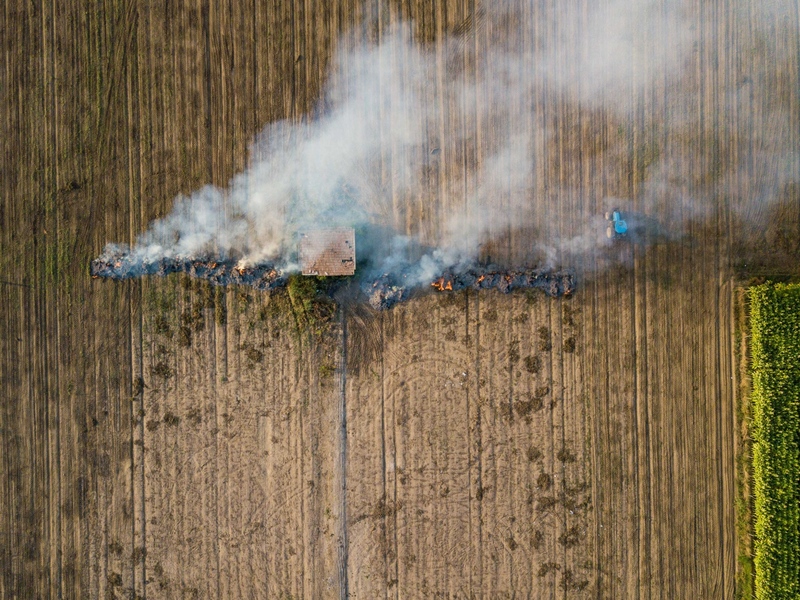 Fire of brushwood behind a tobacco field already harvested in S.Maria C.V., CE. In Caserta, the province with the worst quality of life in Italy, tobacco marks the flat countryside but this sector can slowly disappear. 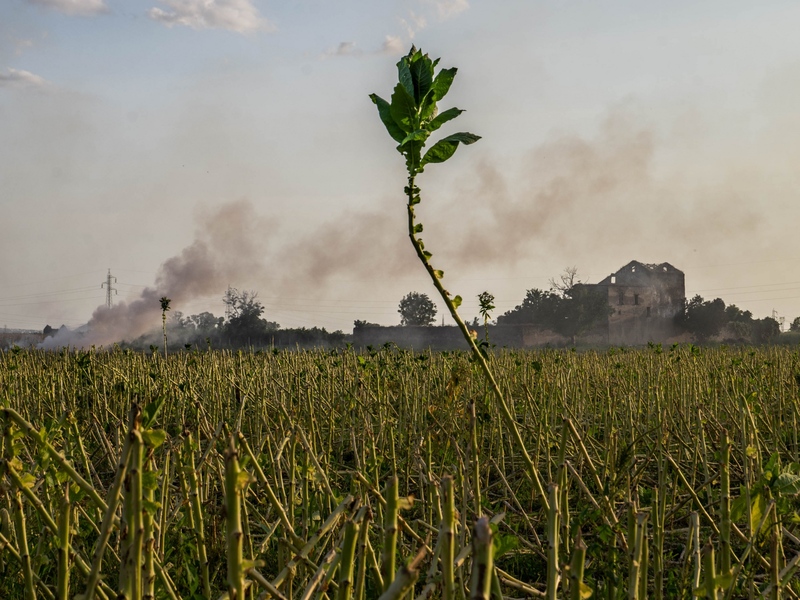 The risk is further marginalization of an area where the impact of Camorra on the environment already characterizes the landscape, made of environmental disasters and air-cured tobacco fields. Italy as a single country is Europe 1st tobacco producer and the 10th globally. Campania alone counts the 48% of total Italian production and the 51% of its total area dedicated to this kind of cultivations. The district of Caserta stands in the north Campania border with Lazio, where tobacco marks the flat countryside bounded by Southern Apennines to the east. This district, known as Campania Felix -“fertile countryside”- by Romans, is an high density population area that stands side by side to tobacco family businesses, usually 1 to 10 hectares each. The high-quality White Burley type grown in Caserta is a light air-cured tobacco useful to fill the blends for American-style cigarettes usually made by Philip Morris. In spring cultivations are mostly made by family-works but once in summer small-scale companies use seasonal labor for harvesting, mainly from Albania, Romania, Poland and Ukraine. Unlike the rest of Italy, farms in the area are usually small-size with high yields thanks to specific and established cultivation methods that also helped to prevent the takeover of workforce’s automation. The influence and impact of the Casalesi clan and the Camorra mafia of Naples on the environment and on almost all aspects of public life/economy is clear and established. In the last twenty years local criminal organization were able to take over different businesses like the management and construction of buildings and shopping centers. The most impactful on environment is the waste management system, where Clans took over from late 90’s, building, racketing and then burning down waste treatment plants all over Campania (and in the last 5-10 years operating with other Mafias also all over Italy for an average of 150 waste treatment plants per year burnt from 2013). Mafias were capable of lobbying local and national governments, modifying laws, creating a de-facto cycle of cancer deaths. They also contaminated great chunks of their own backyard, forcing landlords and farmers to take money for excavation spaces, littering the landscape with heavy metals, solvents and chlorinated compounds, often taken from Northern Italy and other EU countries. Barrels were buried, containers driven into rivers, hazardous materials mixed with household rubbish, chemical sludge spread on fields as ‘fertilizer’, asbestos burnt in open air. Only since July 2018 several landfills and big size toxic wastes has been set on fire in place like Caivano, Benevento, Marcianise, Maddaloni and S. Maria C.V.. Even if the situation it's always been clear to national governments since the late 80's and institutionalised since the Berlusconi era, this waste crisis has never been eradicated and therefore it has gotten worse over time, now a powerful criminal business widespread all over Italy. As a local myself, born and raised with this issues as daily life, I'm realizing this work with the urgency to document a local tobacco sector that can disappear, representative of a region with a millennial agricultural history. Tobacco became also the narrative device to denounce the critical environmental situation where millions of people lives. I’m able to work with strong connections in the area with the possibility (already activated) to involve local institutions, Universities and specialists. After a summer session of more then three months of shooting and journalistic researches, I'm working again in Caserta since November 2018. I'm now focusing on: citizen association and environmental movements that are asking for concrete change; finishing the Augmented Reality contents on the Regi Lagni canal system; in-depth on industrial architecture of former tobacco factories and their reconversions with local University professors from Unicampania and Unisannio; in-depth on shopping centers controlled by Clans working with a local journalist, Salvatore Minieri, following its new book focused on the issue; pagan and religious agricultural commemorations like the Carri di Macerata; 3D still-life for augmented reality of historical monuments and objects from the agricultural tradition.